One real estate development player that's starting to move within range of triggering a big breakout trade is St. Joe Company (JOE - Get Report), which owns land, timber and resort assets in Florida This stock hasn't done much so far in 2014, with shares trading virtually flat. 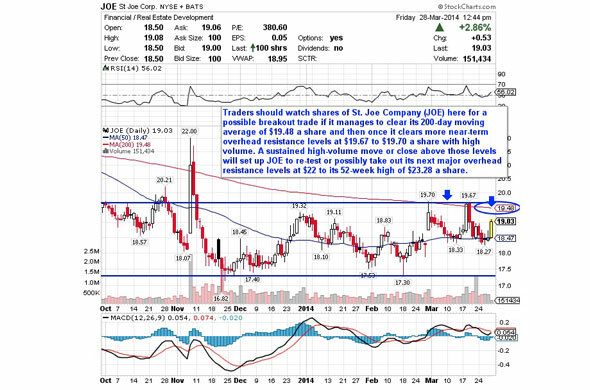 If you take a look at the chart for St. Joe Company, you'll notice that this stock has been trending sideways and consolidating for the last four months, with shares moving between $17.30 on the downside and $19.70 on the upside. Shares of JOE are spiking higher here right off its 50-day moving average of $18.47 a share. That spike is starting to push shares of JOE within range of triggering a big breakout trade above some near-term overhead resistance levels. Traders should now look for long-biased trades in JOE if it manages to break out above its 200-day moving average of $19.48 a share and then once it clears more near-term overhead resistance levels at $19.67 to $19.70 a share with high volume. Look for a sustained move or close above those levels with volume that hits near or above its three-month average volume of 398,385 shares. If that breakout triggers soon, then JOE will set up to re-test or possibly take out its next major overhead resistance levels at $22 to its 52-week high of $23.28 a share. Traders can look to buy JOE off weakness to anticipate that breakout and simply use a stop that sits right below some key near-term support levels at $18.27 or at $17.30 a share. One can also buy JOE off strength once it starts to clear those breakout levels with volume and then simply use a stop that sits a comfortable percentage from your entry point. A health care player that's starting to trend within range of triggering a near-term breakout trade is Gentiva Health Services (GTIV, which provides home health, hospice and community care services in the U.S. This stock has been hit hard by the sellers so far in 2014, with shares off sharply by 26%. If you take a look at the chart for Gentiva Health Services, you'll see that this stock has been downtrending badly over the last four months, with shares plunging lower from its high of $13.54 to its recent low of $8.45 a share. During that downtrend, shares of GTIV have been consistently making lower highs and lower lows, which is bearish technical price action. That said, shares of GTIV might have hit an exhaustion point for the sellers in the near-term, since we've seen heavy downside volume recently and the stock has traded range bound. Traders should now look for long-biased trades in GTIV if it manages to break out above some near-term overhead resistance levels at $9.22 to $9.39 a share with high volume. Look for a sustained move or close above those levels with volume that hits near or above its three-month average action of 299,643 shares. If that breakout hits soon, then GTIV will set up to re-test or possibly take out its next major overhead resistance levels at its 50-day moving average of $10.34 a share to its 200-day moving average of $11.31 a share. 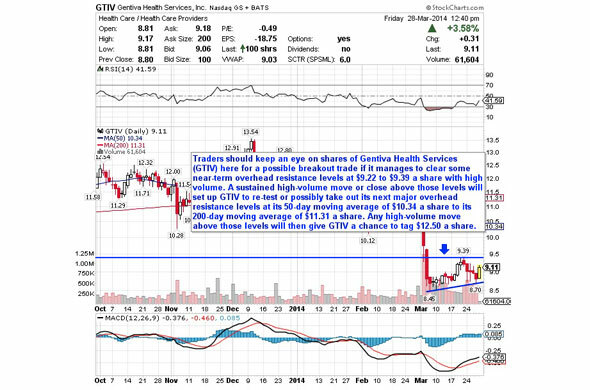 Any high-volume move above those levels will then give GTIV a chance to tag $12.50 a share. Traders can look to buy GTIV off weakness to anticipate that breakout and simply use a stop that sits right below some key near-term support levels $8.70 or at $8.45 a share. One could also buy GTIV off strength once it starts to take out those breakout levels with volume and then simply use a stop that sits a comfortable percentage from your entry point. Another health care player that's starting to trend within range of triggering a big breakout trade is DepoMed (DEPO, a specialty pharmaceutical company that develops products for pain and other conditions, as well as diseases of the central nervous system in the U.S. This stock has been on fire so far in 2014, with shares up sharply by 90%. If you take a glance at the chart for DepoMed, you'll notice that this stock has been uptrending strong for the last six months, with shares moving higher from its low of $6.95 to its recent high of $15.39 a share. During that uptrend, shares of DEPO have been consistently making higher lows and higher highs, which is bullish technical price action. This stock recently pulled back to right above its 50-day moving average of $12.99 a share. Shares of DEPO have started to bounce off its recent low of $13.46 a share and it's starting to move within range of triggering a big breakout trade. 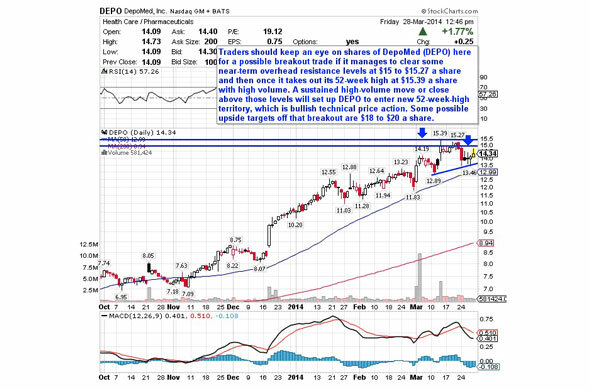 Traders should now look for long-biased trades in DEPO if it manages to break out above some near-term overhead resistance levels at $15 to $15.27 a share and then once it takes out its 52-week high at $15.39 a share with high volume. Look for a sustained move or close above those levels with volume that hits near or above its three-month average action of 975,941 shares. If that breakout materializes soon, then DEPO will set up to enter new 52-week-high territory, which is bullish technical price action. Some possible upside targets off that breakout are $18 to $20 a share. Traders can look to buy DEPO off weakness to anticipate that breakout and simply use a stop that sits right below some key near-term support levels at $13.46 to its 50-day moving average of $12.99 a share. One can also buy DEPO off strength once it busts above those breakout levels share with volume and then simply use a stop that sits a comfortable percentage from your entry point. A technology stock that's starting to trend within range of triggering a near-term breakout trade is VirnetX (VHC, which develops software and technology solutions for securing real-time communications over the Internet. This stock has been crushed by the sellers so far in 2014, with shares off sharply by 28%. If you look at the chart for VirnetX, you'll notice that this stock has been beaten-down badly over the last month, with shares plunging lower from its high of $25.49 to its recent low of $12.68 a share with heavy downside volume flows. During that plunge, shares of VHC have been consistently making lower highs and lower lows, which is bearish technical price action. That move has now pushed shares of VHC into oversold territory, since its current relative strength index reading is 35. Oversold can always get more oversold, but it's also a level where a stock can experience a powerful bounce higher from. Traders should now look for long-biased trades in VHC if it manages to break out above some near-term overhead resistance levels $14.85 to $14.88 a share and then once it takes out $15.20 a share with high volume. Look for a sustained move or close above those levels with volume that hits near or above its three-month average action of 672,277 shares. If that breakout gets underway soon, then VHC will set up to re-test or possibly take out its next major overhead resistance levels at its 50-day moving average of $17.20 a share to its 200-day moving average of $19.23 a share. 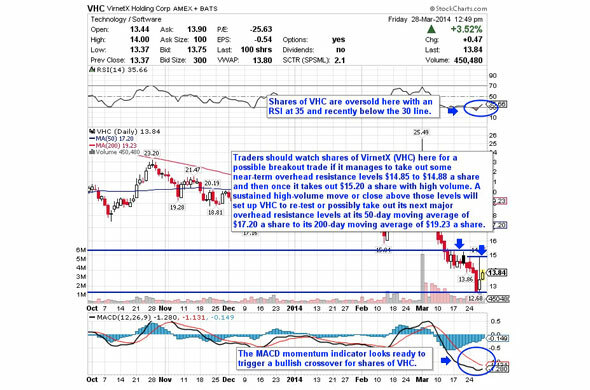 Traders can look to buy VHC off weakness to anticipate that breakout and simply use a stop that sits right around its recent low of $12.68 a share. One can also buy VHC off strength once it starts to clear those breakout levels with volume and then simply use a stop that sits a comfortable percentage from your entry point. My final breakout trading prospect is personal products player Blyth (BTH, which operates as a direct to consumer marketing company in North America, Europe, and Australia. This stock has been under selling pressure over the last six months, with shares off by 21%. If you look at the chart for Blyth, you'll see that this stock recently formed a major bottoming chart pattern when buyers stepped in to support the price whenever it pulled back just below $9 a share. Following that bottom, shares of BTH have started to uptrend and move back above its 50-day moving average. That move is starting to push shares of BTH within range of triggering a big breakout trade if the stock can manage to take out some key near-term overhead resistance levels. 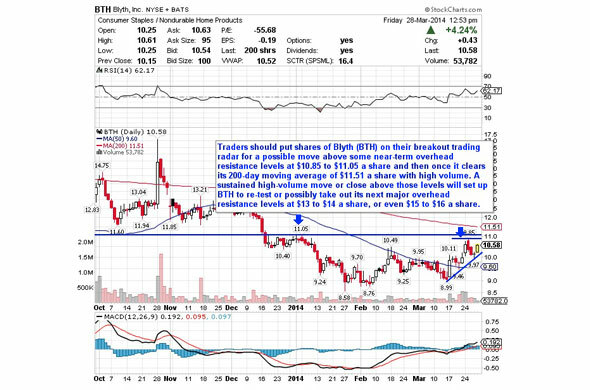 Traders should now look for long-biased trades in BTH if it manages to break out above some near-term overhead resistance levels at $10.85 to $11.05 a share and then once it clears its 200-day moving average of $11.51 a share with high volume. Look for a sustained move or close above those levels with volume that hits near or above its three-month average action of 137,518 shares. If that breakout triggers soon, then BTH will set up to re-test or possibly take out its next major overhead resistance levels at $13 to $14 a share, or even $15 to $16 a share. Traders can look to buy BTH off weakness to anticipate that breakout and simply use a stop that sits right around some near-term support at $9.46 a share. One can also buy BTH off strength once it starts to take out those breakout levels with volume and then simply use a stop that sits a conformable percentage from your entry point.